Sometimes you might get a little worried that the data on your hard drive are getting corrupted. Occasionally, you might be compelled to run a “chkdsk” or “Check Disk” process (or, in Windows 9x terms, a scan disk!). The process is fairly simple. Here is how you do it in Windows 7, and the steps are nearly identical for Windows XP. Open up Computer (or My Computer) either from the Desktop or the Start Menu. Right Click on the drive you want to scan. Click the Check now… button. 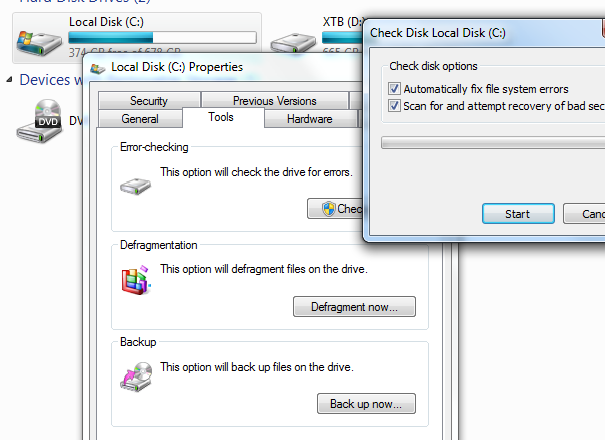 Check both boxes (if you want to scan the drive itself for defects, rather than just search for corrupt files). During the startup process, the screen will have a 10 second count down that you can interrupt if you need to – but after the count down completes the scan process will start. It takes, on average, about an hour. The screen should say that it is on Phase 1 of 5 if you are doing the full surface scan.